I bought a spiralizer a few months ago, and I have to say I love it. Sure it looks like a guillotine, and so far I have only spiralized carrots and courgettes, but I still love it. I have many dreams of salads and fancy deep dishes made from myriad stringed vegetables, but so far I have not achieved those. But I have mastered the courgetti– and many delicious sauces to go with it. This week I had it as a post-gym dinner, so I chose to supplement my courgetti with some regular ol’ spaghetti. I know it’s unorthodox, and some health food bloggers might want my head for it, but whattyagonnado? I fancied some carbs- and after the gym is when I have them. I did keep it on fleek with my delicious avocado pesto though. If you are unfamiliar with this delicious and healthy variety of the Italian staple, you have been missing out. 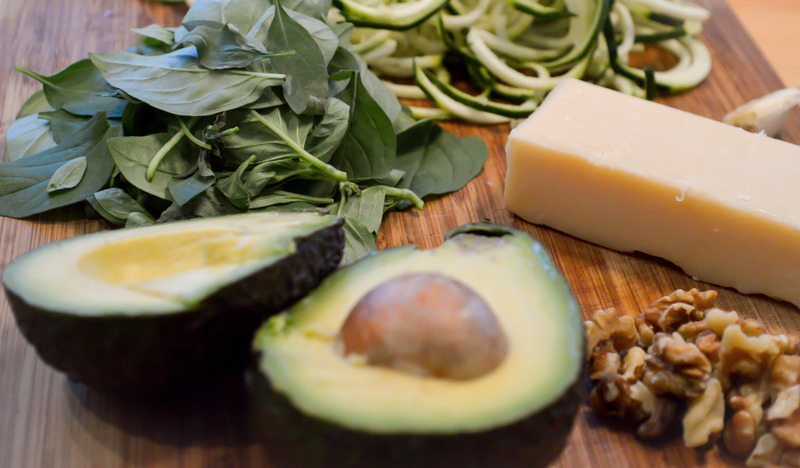 The avocado replaces the vast amounts of oil that conventional pesto requires, and ads a subtle richness to it. It is a super quick and healthy recipe, and I swear by it. The only issue is that it doesn’t keep very well as the avocado browns- so make it then eat it in quick succession. Note: I spiralized one enormous courgette and topped it up with a handful of conventional spaghetti. Please do make as much courgetti as you feel is good for you, or just have it with plain spaghetti. First of all, spiralize your courgette and save it. Cook the pasta as instructed by the pack. As the pasta cook, and the courgette waits, whizz all the ingredients for the pesto in a food processor- don’t forget to peel the avocado and the garlic please! make sure all the ingredients are nicely incorporated to form a paste, but not so mushed that the walnuts disappear. If you find that it’s a little too thick, add another spoonful from the remaining avocado and a dash of water. When there is one minute left on the spaghetti, drop all the courgettes in there and let them boil together for the final cooking minute. Drain the pasta and veg very very well, then toss with the pesto. Add the cherry toms and the mozzarella and ENJOY. 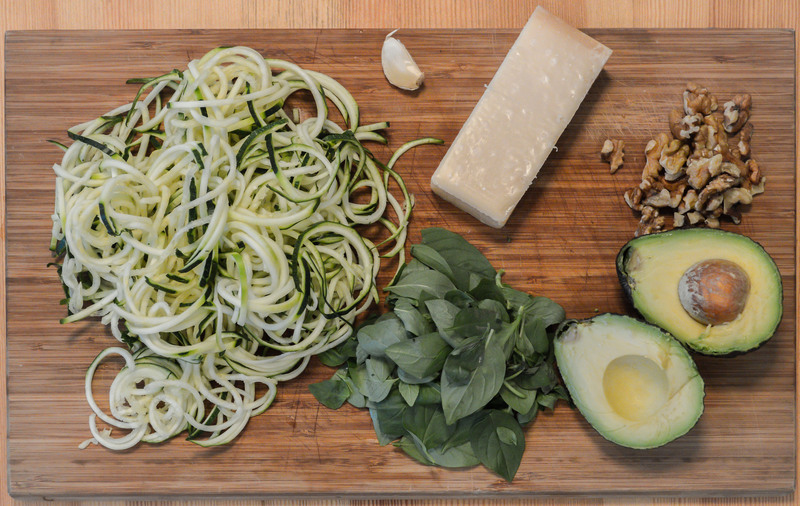 We have been dying to try a spiralizer! This looks amazing. do it! you will never look back! Thanks for the tip! 😀 Will try for sure!